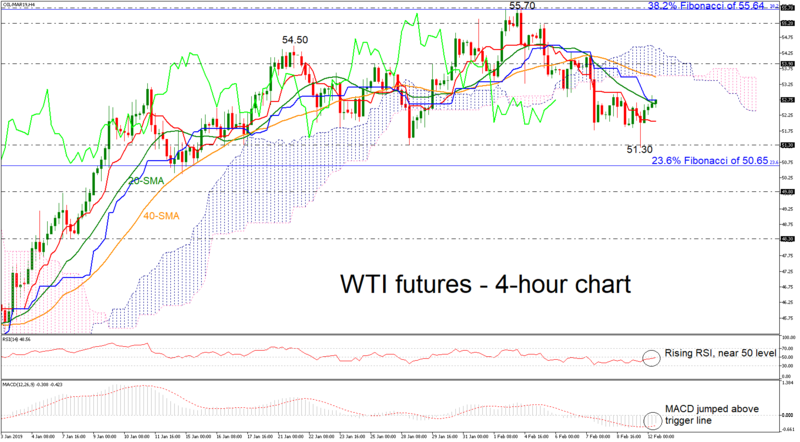 West Texas Intermediate (WTI) crude oil futures are edging slightly higher, surpassing the Kijun sen line and the 20-simple moving average (SMA) in the 4-hour chart, indicating a possible upside retracement. However, the price remains below the Ichimoku cloud and the technical indicators are still standing in the negative zone. The RSI is approaching the 50 level, while the MACD jumped above the trigger line in the near term. Moving higher immediate resistance could come from the 40-SMA currently at 53.90, before heading towards the 55.20 level, registered on February 5. A stronger barrier though could be found at the 38.2% Fibonacci retracement level of the downleg from 76.90 to 42.50, near 55.64. Should the market extend losses, support could be met at the 51.30 support level, which is acting as strong obstacle as the price has failed to drop below it over the last month. A significant leg below this area could send prices towards the 23.6% Fibonacci of 50.65, while more losses could challenge the 49.80 hurdle. Turning to the medium-term, the outlook seems to be neutral and only a decisive close above the 61.8% Fibonacci could create a bullish picture. On the other hand, a close below the December’s low of 42.50 could shift the outlook back to bearish.